Because someone once told me that Emily Giffin’s books are formulaic, fluffy, and devoid of any real plot, I’ve avoided them. But I was looking for a light pick-me-up last week, found Baby Proof at the library, and after being captivated from the very first page, I finished this book in 2 days flat. I don’t recall who told me to avoid Emily Giffin’s books, but whoever you are, you have bad taste in books! Anyway, this is the story of 35-year-old Claudia – a successful editor, a loyal sister, and a loving wife. Claudia’s life seems perfect until her husband Ben suddenly decides he wants to have a child, despite their previous decision to remain childless by choice. After her unexpected divorce, Claudia buries herself in her work, and turns to her family and friends for support as she tries to pick up the pieces. Although she never stops loving Ben, she eventually moves forward and begins dating her dashing colleague Richard. And it is Richard, along with Claudia’s sisters, her best friend, and a smattering of other well-developed supporting characters, who allow Claudia to see what sacrifices she is willing to make to have the life that she really wants. Thanks to Giffin’s engaging writing and thought-provoking characters, Baby Proof isn’t your typical chick-lit beach read. The author cleverly manages to include several strong supporting story lines, each with their own baby-related/marital issues, and these parallel stories allow the reader the benefit of seeing the challenges of parenthood and marriage from a number of opposing viewpoints. As someone who always thought she was too selfish to have children, I can understand Claudia’s thought process perfectly. But as a mother who is now so lucky to have the unconditional love of a kid with a heart of gold, I can understand Ben’s need to have a child of his own. In short, Giffin’s remarkable insight allows the reader to relate to each character, and often on more than one level. Bottom Line: Baby Proof is moving, honest, and thoughtful. An easy read, I finished this book quickly and have now moved on to read the rest of Emily Giffin’s books. Ameena! Do NOT listen to that person. Emily Giffin is a great writer. 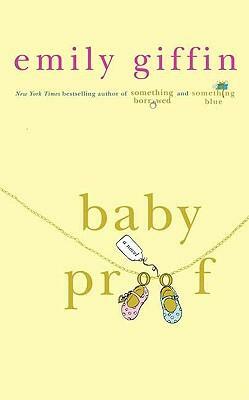 I read Baby Proof a while ago now and thought it was good. But I really liked her other two books more than Baby Proof – “Something Borrowed” and “Something Blue”. I read them years ago but I’d like to re-read if I ever get time in the future. On the surface they seem like ‘chick-lit’ – yes – but I think Giffin really gets into the heart of the character and I find myself empathizing with them. (and yeah I heard the Borrowed movie sucked – but most book movies do really). I read another book by her as well – I think it was called “Love the one your with” – it was good but I actually was hoping for a different ending. I just finished “Love the One You’re With” and it was good. It took a while to get going though and I agree…I expected a different ending. I am heading to the library today to get some of her other books! Thank you for the recommendations. Have to check out this book sounds interesting Ameena, yes I do love your other blog. Read “The Heart of The Matter”. Good book. I always thought Giffin was a writer like Sophie Kinsella. Then I read her books and realized they are both really good. Although, I consider them both “lighter” reads which is good at times. I recently read “The Help” and loved every minute of it. Also read a book called “The Particular Sadness of Lemon Cake” by Aimee Bender. I have mixed thoughts, but a quick interesting read nevertheless. Room was amazing. Have you read? I’m more of a YA and MG reader lately, but I like to spread my eyes to diffferent genres to get me daydreaming and thinking. I think that Giffin is actually better than Kinsella because her books have a lot more substance. But I do LOVE both writers. Room is one of my favorite…shocking and hard to get through but amazing. I wasn’t really into The Help though…I might be the only one who didn’t think it lived up to the hype? Ameena, from all the people I know on the only blogging community – I would have thought you was the last person to be influenced by someone in not doing something – gosh I’m shocked. I had you down as one of those who simply needs first hand experience at it to make up her own mind. Was this a one off? Anyway – I liked your review as I like books that generally have good substance in them. To be fair all your books here good reads its just finding the time to read them. Well said actually…now that I think about it I agree that EG totally brushes off infidelity as though it’s nothing. Especially in Something Borrowed. But even with that said, I just LOVED the book. I can’t wait to read Something Blue next!